Use disability standard switches on classic games machines and computers. A cheap and vast source of fun games and activities. Compatible with many 1970's and 1980's games machines. Many fun and empowering uses! Click here for compatibility list. Buy cheap Atari and Commodore computers from eBay. * Contact us if interested in using for Mouse control. Adaptation Service - I may be able to adapt a controller to your specifications, and if not, point you in the right direction. D.I.Y. 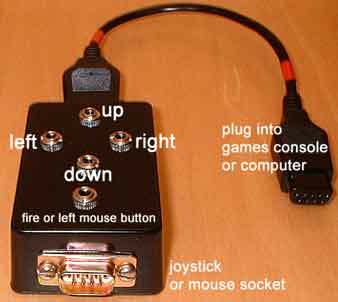 - Step by step guides for adapting most games machines for disability switch use. Atari 2600 games are often very clear and easy to follow. Virtual vs. Real games: Use an accessible computer set-up running Darts, Pool or Snooker next to a real dartboard, pool or snooker table. ("180 Darts" for the Commodore 64/128, and "Archer McClean's Pool" and "Snooker" for the Atari ST or Commodore Amiga are superb for this). Explore the heritage of video games. 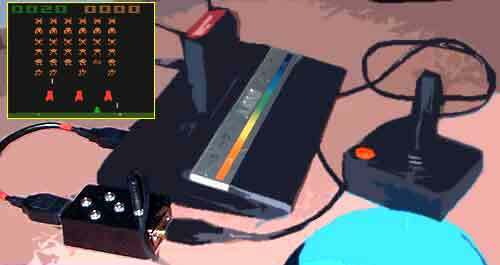 Create Art using an Atari ST - then transfer to a PC to print out. Experiment with light using Llamasoft light synthesisers. Great for teaching up, down, left and right.